Insurers delivered a victory for environmentalists and dealt a body blow to Turkey's economic regeneration plans yesterday by pulling the plug on a bitterly contested dam project that critics claimed would wreck habitats, displace people and drown ancient archaeological treasures. A consortium of German, Austrian and Swiss insurance firms ordered a halt to the £1.1bn Ilisu dam in Turkey's impoverished south-east after concluding that it failed to meet standards set by their governments and the World Bank. The decision means suppliers underwritten by the insurers will have to stop work on the dam, located by the banks of the Tigris near Turkey's borders with Iraq and Syria, for 180 days and casts doubts on its long-term viability. Environmentalists, heritage organisations and human rights groups campaigned against the project claiming it would have meant the loss of around 80 towns, villages and hamlets and the destruction of large areas of farmland. They argued that the mainly Kurdish local population had not been properly consulted and that between 50,000 and 80,000 people would be forced from their homes without compensation. 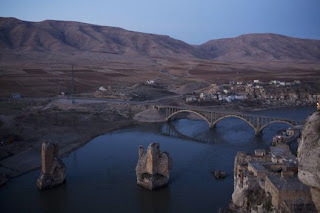 Heritage campaigners also claimed that the project would flood ruins from ancient Mesopotamia in the town of Hasankeyf and other sites, which are believed to contain evidence of 100,000 years of human occupation. For full article, click here. The proposed dam has long been controversial, and has had both human rights and environmental groups mobilized for some time. There were concerns earlier this year that the German government might block the dam's construction. Hasankeyf was featured in an issue of the Atlantic this past November. See also Yigal Schleifer's earlier reportage of Ilısu, and the Southeastern Anatolian Project (GAP) of which it is part. The AKP had sold the project on the grounds that it was vital to the economic development of the Kurdish southeast, though it is likely a majority of Kurds opposed it. Also happy will be Turkey's southern neighbors, Syria and Iraq, which had both expressed anger at Turkey's decision to dam the valuable water of the Tigris.